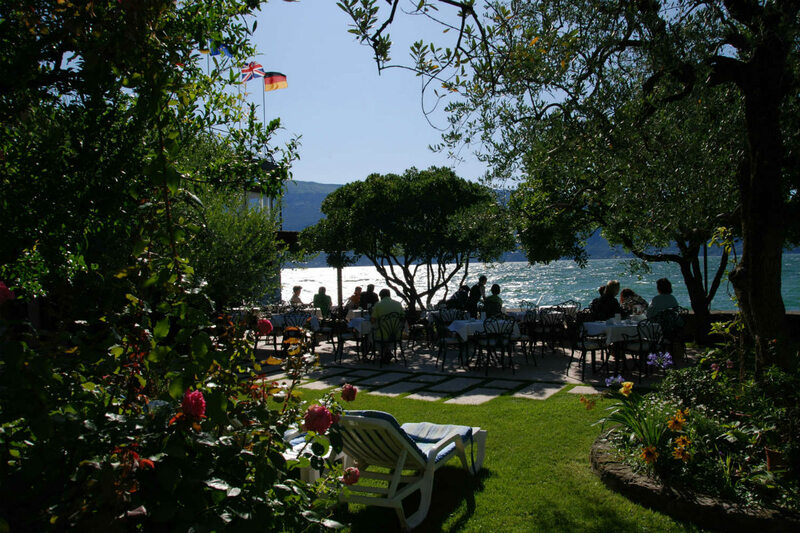 At the Hotel Gardenia al Lago the tempo of the day is marked out by the light, the wind and the lake water. These elements are a constant presence for our guests, a natural clock to accompany them through the day, from when they wake up in the morning until they nod off in the evening. In the early morning the lake is calm, and the lapping waters are slow and rhythmic. The sky becomes gradually lighter until the sun finally peers over the top of Monte Baldo and begins to illuminate our mountains, starting from the highest peaks, and making its way slowly down through the valleys and sleepy hamlets until it finally reaches the walls of our hotel, and then the garden. A new day has begun. 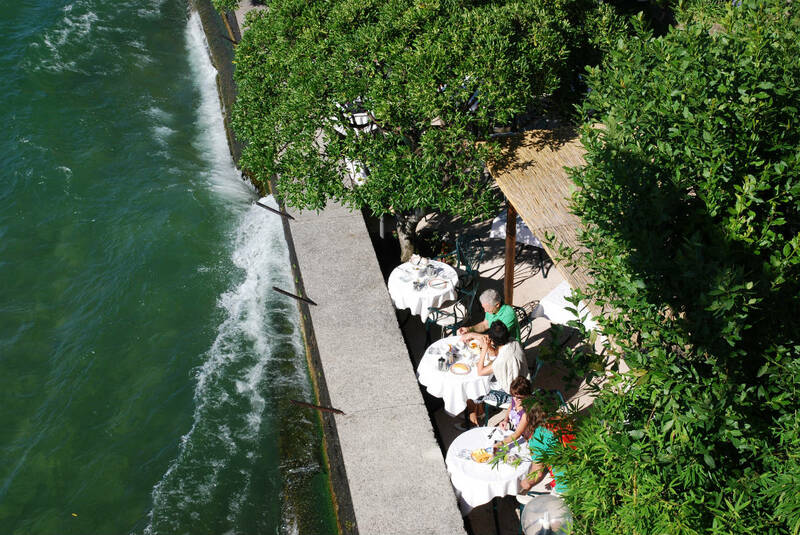 Breakfast is served in the garden right on the water’s edge, shaded by olive and bay trees. The first boats have already set out onto the lake, and one or two guests have decided to make the most of this pure morning serenity with an early dip. The mallard ducks stroll from one seat to the next in search of stray crumbs, counting on the indulgence of some kindly guest. The breakfast tables offer a grandstand view of the arrival of the Peler, the strong north wind that will see the guests through the better part of the morning. 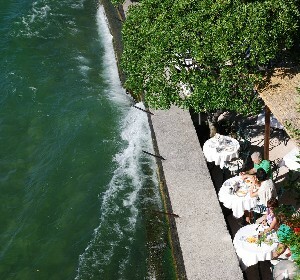 The lake becomes rippled, a little choppy, and the first waves reach the shore whilst curls of white foam can be seen further out. This is the Mediterranean lake, vigorous, standing out between the blue of the sky and the green of the mountains. 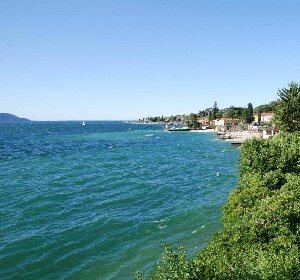 The sun is now high in the sky, shadows are short, the lake is once more calm and flat, and we begin to get a real sense of the sheer size and greatness of Lake Garda. The tables have been relaid: it is time for lunch. A number of guests are sitting on the sunbeds at the end of the garden contemplating nature, reading a book, sipping a drink or simply enjoying a moment’s relaxation; others have got up to come to their tables and eat a quick, refreshing lunch: some salad, an hors d’oeuvre or a plate of pasta, before returning to whatever activity they have left unfinished. The lake undergoes another transformation, it begins to ripple as a light wind comes in from the south: this is the Ora, the unfailing afternoon breeze. 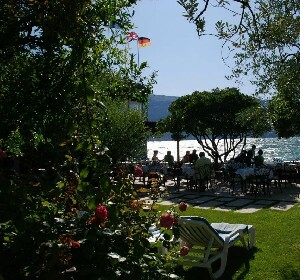 The afternoon is the time when guests love to take full advantage of all that the lake has to offer. Those who spent the morning at the hotel are now joined by those who chose to take a walk along the inland pathways, or to visit a museum or a nearby city to get their fill of art and culture, or perhaps to take a boat ride. The garden comes to life. The bar service means you can sip an espresso or a cappuccino, enjoy an ice-cream or a cool drink in the shade of the garden’s trees and shrubs. The sun is hot, ideal for those seeking the perfect tan, whilst for the other guests, the search for a more shady spot takes precedence. The Ora is stronger now, and it blows with more conviction, bringing us its balmy coolness in the heat of the day. 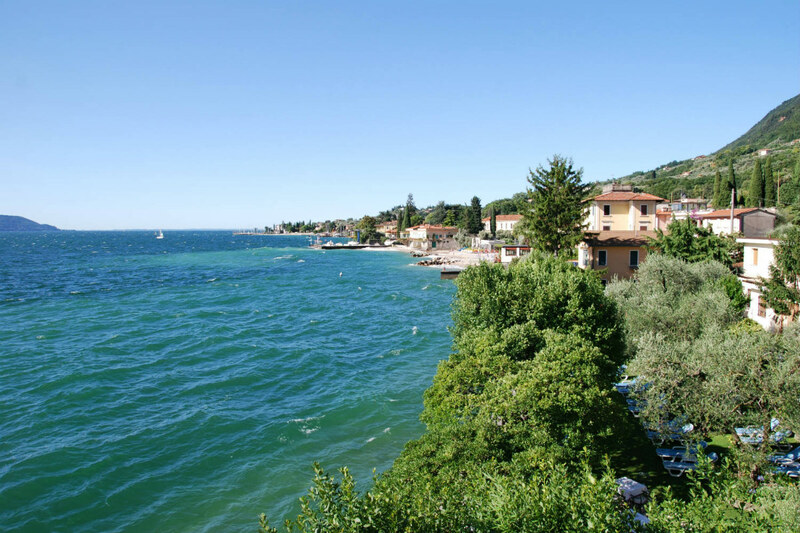 Now is the time for a refreshing swim in the lake, or a kayak trip to view the Gargnano coast from out on the water, with all its splendid villas and distinctive historic buildings. The afternoon passes quickly, and the Ora soon leaves us to make way for the evening. The sun is about to drop behind Monte Pizzocolo, and the peaks of Monte Baldo light up in soft shades of pink. The lake, placid once more, darkens, and the blue sky is streaked here and there by pink clouds: it is sunset. The guests watch this spectacular show from their balconies, but the call of nature is strong, and they soon respond by returning once more to the garden. It’s time to enjoy sipping an aperitif before dinner. The sky is a deep blue, the sun has said good-bye until tomorrow, the lake is inky and smooth. We are sitting at our table once again, the ducks have returned to keep us company from under the table. 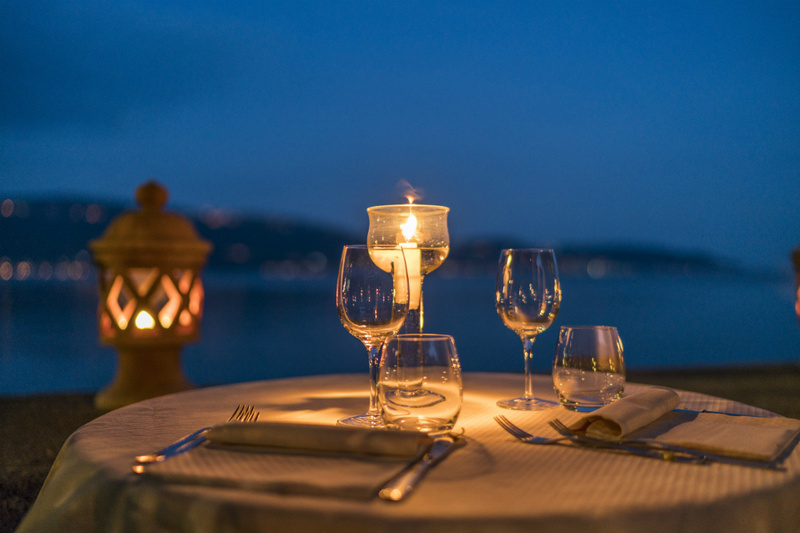 The glowing candles herald the romantic, tranquil atmosphere of the meal that awaits us. But then we are surprised once more to notice that the treetops begin to move, gently at first, then more vigorously. The once-limp flags on the terrace are coming to life, stretching and fluttering. The lake in front of us is forming little peaks, but not all over, only in the space of a few hundred metres around us. 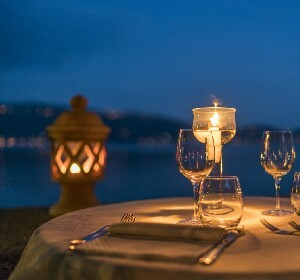 This time the breeze is from the west, tumbling down from the mountains: it is the San Carlo wind, which only blows here, bestowing its evening freshness upon us, staying with us until after nightfall, as if it were nature’s own air conditioning. The moon has risen above Monte Baldo and is now high in the sky, the hotel lights come on, illuminating the façade and creating an elegant, magical atmosphere. It is time for a short stroll through the old village before dropping gently to sleep, secure in the knowledge that a new day will soon be dawning over the lake, at the Hotel Gardenia al Lago.